the show that requires a quizzer's brain and an antique expert's eye. is matched only by his good looks. Or at least that's what he tells me. Would you, please, welcome Paul Laidlaw! -You're a man who wears a tartan suit well. Now, tell me, what have we got in our collection today? of one of their items. which is only a tenner or less. Hi, I'm John. And this is my son, Tony. We like to collect anything and everything. Welcome, the pair of you. Team two, who are you? I'm Susan and this is my husband, Alan. -and Susan collects anything elephant related. -Aha! Good to see you. Hi, Fern. I'm Cynthia. This is my mum, Hilda. -and I collect cruet sets. -Very nice to have you here. but could they separate the rich from the kitsch? Let's see. -Cor, where do you start? Two women on a mission! All reet! That's not my favourite thing. Let's have a look at the movement, movement is everything. -It's a hall stand, isn't it? -I would have said Edwardian, possibly. These guys are on it. I'd say Bohemian, possibly, Czechoslovakian. -The painting's not brilliant, is it? Now, are those Queen Anne legs? -I shall use that as a cataloguing term henceforth. -It's been re-covered, though, hasn't it? -To be honest, it looks like mass produced to me. -It's transfer print, I think. -Is it a mace, or is it a...? Yes, that's definitely a mace. -one of my favourite illustrators. -Oh, we're in the zone, now! -Not my thing, books. You're more the book lady. It doesn't do anything for me. -Feel how light that is. It's not got much wear to it, he hasn't used it much. A toy. It's got a box and the box is in reasonable nick. Well, a lot of these come over from Japan. It's from the television programme Highway Patrol. With Broderick Crawford, if I remember rightly. cos I think that's fairly self-evident. -It's got, there, a name. -Vogel and Noot, of Wartburg. This could be silver plate. Foreign silver, quite old. Could be Indian silver, Indian motifs. They've gone with medium, origin and condition there. You can't argue with that analysis. That looks like a mustard spoon, doesn't it? Hallmarks on there. Looks like George III. That could be diamonds and sapphires. for a crescent of sapphires and diamonds. It's got quite a nice setting, I can't see a hallmark on it. I think the top lot's the book. -I think the truncheon's the booby trap. spoon and I think the bottom lot is the truncheon. Cups or brooch, top. Bottom, like you're saying, tankard, over there. -It must be fun spying on them, Paul. Some people, it's all about heart. "I like, I don't like." Others - forget my own taste, analytical, what it's made of? When was it made? What's the market like for this? Onto the next. -And how are the values of these items decided? Just to add an extra twist, we have our mystery lot. Now, it could be worth thousands, or it could be worth peanuts. That is for our winners to decide, a little bit later. But for now, teams, it's time for round one. I'll ask you to select which lots you would like to be playing for. you'll be frozen out of the next round. John and Tony want the brooch. Susan and Alan, the cups. Hilda and Cynthia want the book. Which famous physicist is known for his three laws of motion? Correct. Isaac Newton, it is. The cups are yours. Oh, Susan, you were very quick off the mark, there. Look out, teams. Pickers, pick a lot. but Susan and Alan also want the brooch. Hilda and Cynthia still want the book. Question two. In the Beano, what is the name of Gnasher's son? Gnasher's son is called Gnipper. Of course he would be. OK, here we go for question three. Pickers, please, make a pick. John and Tony going for the spoon. Susan and Alan still wanting the brooch. Hilda and Cynthia really want that book! Quizzers, question three. How many wheels does a unicycle have? One it is. The brooch is yours. John and Tony still want the spoon. Susan and Alan, the hall stand. Hilda and Cynthia still really want that book. The katana was the main weapon of which Japanese warrior? Correct, the samurai. You've finally got the book in your collection! John and Tony still really want that spoon. Susan and Alan wanting the hall stand, but so do Hilda and Cynthia. Time up. And that's an interesting one. -First Lady Of The United States. It is! Very good. Here we go. Susan and Alan want the hall stand, but so do Hilda and Cynthia. which Sergei Prokofiev ballet is based on a rags-to-riches fairytale? The hall stand is yours. John and Tony switched tactics. They want the tankard. Susan and Alan now going for the vase. Hilda and Cynthia want the toy. what type of creature is Sonic? It is a hedgehog, correct. The vase is yours. Pickers, make your final pick in this round, please. John and Tony want the tankard. Susan and Alan want the spoon now. And Hilda and Cynthia want the clock. Final question in this round, quizzers. Which word is defined as the study of family history? You have got the clock in your collection. their collections at the end of round one. John and Tony are waiting for the right moment. Susan and Alan have the cups, the vase and the brooch. And Hilda and Cynthia have the book, the clock, and the hall stand. to make a valuation. But let's hear more about you. John, what do you like to do? stamps and coins. Going around antique fairs. Fishing. In general, I keep myself busy and active. Tony, how old were you when you first started collecting? from when I was about six or seven. not always what it's worth. The provenance, where it's come from and if they could only talk. -That's the romance of it, isn't it? -It is, it's wonderful, yeah. So, what would you both like to know more about? It could be in someone else's collection or on the board. -I would like to know more about the tankard. with a Chinese export porcelain famille rose armorial tankard. sixth emperor of the Qing Dynasty. object bearing a Geordie coat of arms. will this be our contestants' cup of tea? Mm! Well, John and Tony, welcome. while we meet Susan and Alan, team two. Lovely to see you. So, Susan, how did you and Alan meet? and Alan was just leaving. -And did you like him, straightaway? "Well, actually, there's something special about him." Hang on! You've gone out with him for six months not liking him? -The moustache had something to do with it. Oh, well. We'll find out more about that in a minute. Alan, welcome. Tell me about the hat you're wearing. -and all sorts of bits and pieces. What would you like to know more about from Paul? Well, these are a pair of silver plated drinking cups. It's not possible to tell exactly the origin and date of these. They're certainly not original Aztec pieces. They are obviously, however, Aztec inspired. as you revolve the tumbler. whose name translates as the night drinker. Now, would you dare enjoy a sip from Youalahuan's tumblers? -Yes, I think Alan's up for that. Hilda and Cynthia. Lovely to have you here. You describe yourself as a collectable. Yes. Well, my daughter calls me a hoarder. -A hoarder more than a collectable. What is in the house that is hoarding? Oh, where, where, where would you start with it? I mean, I've drawn the line at the beer mats. There are hundreds of beer mats. And now we've got the cruet sets. -Oh! That's genius, isn't it? -It's... in a beautiful flesh pink. -I'd like to know more about the book, please. Now, this next item is an 1888 first edition Oscar Wilde classic. This novel's beautifully illustrated by Walter Crane and Jacomb Hood. This book was printed by Ballantyne, Hanson and Co.
Based in London and Edinburgh. Now, we all know first editions can be vastly valuable commodities. especially when talking about something as fragile as a book. creases and a tanned spine. There's also a few small tears. Now, if you choose this, will you end up happy with a princely sum? Or just another tall tale to tell? Hm. Thank you very much, Paul. Right, you all know a little bit more, so shall we play round two? and secure it by answering correctly. with their own question categories. And here they are. Human Body, or The Weather. John and Tony, you're up first. Good luck. Tony, what's your lot? The tankard. John, Leonardo da Vinci or Fashion? Hm. Neither are my strong points. I'll go for Leonardo da Vinci. Leonardo da Vinci was born in which modern day country? Correct. Italy it is. The tankard is yours. Your collection has started with something I think you really wanted. Alan, what lot would you like? The spoon. Leonardo da Vinci, Susan, or Chinese Food? -Let's go for Chinese Food. but I don't think it's that. Unfortunately, it's not dim sum, it's chow mein! OK. The spoon stays on the board. Hilda and Cynthia. -I think I'll go for the toy, please. The toy. Hilda, the Human Body or The Weather? -The Human Body, I think. that gives skin and hair its pigment? Now, teams, have you missed out on that one item you really wanted? or you can try and steal it from a rival team's collection. John and Tony, do you want to pick or steal? -Yes. What would you like? Leonardo da Vinci, or Chinese Food, John? I think I'll go for Chinese Food this time. -Yeah. Peking is now known as Beijing. -Alan, do you want to pick or steal? I'll pick the spoon again, please. The spoon. Leonardo da Vinci or Chinese Food, Susan? -so I'm going to go for Leonardo this time. 13 is correct. Yes, the spoon is finally yours. Cynthia, do you want to pick or steal? -I think we'll have another go at the toy. Human Body or The Weather, Hilda? -I'll have a go at The Weather. by the Met Office was given what girl's name? There was a Katrina, but I don't know whether that was British. This is hard. It's not Katrina. Right. We've got one more go at this. some ruthlessness in you. John and Tony, pick or steal? I'd like to steal, please. -What do you want to steal? -I'd like to steal the spoon. what category do you think John is going to have difficulty with? He's playing this quite close to his chest. who wrote the musical Blood Brothers? No, it's not Andrew Lloyd Webber. -It isn't Andrew Lloyd Webber, I'm so sorry. that was very well defended. Now, Alan, pick or steal? I'm not going to be mean. I'll go for the chair, please. The chair, Hobbies or Fashion, Susan? although I'm not really into Fashion, either. See what you can make of this one. for his handmade women's shoes? The only one I can think of is Jimmy Choo. Well, that was lucky, because it's correct! Congratulations, the chair is yours. -I think I'll steal the cups, please. They are with Susan and Alan. What category do you want to give Hilda? -Go for The Weather again, please. The Weather. The Weather, Hilda, here we go. the direction of the wind? Weather vane is the correct answer. Hilda, the cups are yours. Susan and Alan, you've lost them. Right, that is the end of the round. John and Tony have the perfectly formed tankard. Susan and Alan have the brooch, the spoon, the chair and the vase. and the hall stand. OK. For one team, it is now the end of the road. Paul, who is leaving us first? That's quite a shock when you have four things in your collection. the value of each of the things in your collection, don't you? -So, Paul, shall we start with the chair? Prayer chairs were made initially for private worship. and is pleasingly upholstered, very much good to go. and fastens with a simple pin and hook catch. but did it have enough to turn your head? This is a 19th-century vase made of enamelled cranberry glass. and portrait of an unidentified woman. This cranberry glass is likely bohemian. and that's what we see here. After all that, its value? This is a silver salt spoon from around 1823. It has a mark for Sheffield, with the maker Thomas Turner and Co. Traditionally a silver spoon was given as a Christening present to a newborn baby. born with a silver spoon in his or her mouth. Value of this little period spoon as we see it today? Would you believe it's worthless? Susan and Alan, you collected a fantastic set of things there. and say thank you for playing For What It's Worth. And also, the unclaimed items in the grid are now leaving the game. What we have here is a traditional police truncheon. a truncheon was the norm. This particular piece is made of rose wood. and has a handsome turned wooden handle. but we won't go into how they may have come about. Value for such a thing? A bit of nostalgia here, with the toy. who remembered it from her youth in a television programme. and one of the first toy imports from the east. and entertain children of yesteryear and indeed today. And lastly, the shovel that had you perplexed. "Why on earth is there a shovel here? "There must be a good reason for it, surely." Well, this is a fascinating object. A German entrenching tool that was used during World War I. Yes, this item has recently celebrated its 100th birthday. a heart in fire pierced by an arrow. Its value? Lowly old shovel? which may be worth even more. Let's start with John and Tony. Is it the hall stand, please? Here we have a 19th-century brass mounted hall stand. by James Shoolbred and Co.
creating textiles for the furniture market. for being a provider of quality pieces. But should this make an elegant stand in your collection? Hilda and Cynthia, what would you like to know more about? Well, I think we've heard about everything so far except the clock. -Now, this is a 19th-century bronze mantle clock. who is shown holding the lyre and laurel wreath of her brother Apollo. creates a perfect symbolism of night turning into day. but so were many others - a prolific manufacturer. You'll either love it or you won't. and at the end of this we will have our winners. Now, in this round I'll show you a category and 12 possible answers. Nine answers are correct, three of them are not. and your opponent will be able to steal a lot from your collection. then the team that gives the final correct answer will be the winners. Paul, who is that at the moment? World War II British Military Aircraft. types of British military aircraft used during the Second World War. -Would you like to go first or second on this question. -First? Right. Here we go. Let's have a look at the answers. Hilda, give me an answer? Hawker Hurricane. If this goes green, it's correct. Correct! Yes, the Hurricane played a major part in the Battle of Britain. Known for its bomber's sting and the whine of its engines. Oh, crumbs, I was hoping for the Mosquito myself. I'll go for the F-14 Tomcat, please. That's the plane from Top Gun, the film. -Oh, of course it is! -A long time after World War II. OK, let's have a look at the other wrong answers. Buxton Blue is a British cheese. John and Tony, you're now in a very good position. What would you like to steal from Hilda and Cynthia? Actually, I'm more tempted by the clock. -I'm going to go for that. -OK, the clock is yours. Oh, I'm sorry, Hilda and Cynthia. Right, John and Tony, this time it's your question, and here it is. You need to find the names of cities which are part of Spain. First? OK. Here are the answers. John? Give me an answer. Yes, correct. It's in eastern Spain. Correct. A city in Andalucia. Yes, correct. Bilbao, up in the north. Correct. Founded by the Romans. Correct. Very popular holiday destination. Correct. That was the capital of Spain until the 1560s. Oh! That's a type of yeast bread. Arbol is the Spanish word for tree. Mato is a type of Spanish cheese. Well, Hilda and Cynthia, you can steal. Do you want the clock back, or shall we have their tankard? -we are from Newcastle and it is an armorial from Newcastle. -Well, we'll have that, then. -We'll have their tankard, please. Well, the tankard it is, then. Coming into your collection. OK. Third and final question. Hilda and Cynthia, here it is. the official James Bond films? First or second, Hilda and Cynthia? -First? OK. Here are the answers. Interesting. Hilda, give me an answer. Correct. From Diamonds Are Forever. Not my strong point. May Day. Correct. Grace Jones played her in A View To A Kill. I think it's got to be Kissy Suzuki. Oh, I hope so. Kissy Suzuki. Yes. From You Only Live Twice. Correct. From Tomorrow Never Dies. She's from the television show Alias. Sabina Pleasure is an Alex Rider character, from Stormbreaker. John and Tony, that means you can steal a lot from your opponents. -Got to be, isn't it? -Got to be the tankard, eh. It has to be the tankard. The tankard is yours. This could be a make or break decision for our teams. Paul, who are today's winners? Well, congratulations, Hilda and Cynthia. But many commiserations to you, John and Tony. but you played that to the death, both teams, brilliant. you want to find out what those items were worth, don't you? -So, here we go. Paul, let's start with the clock. The clock... What a joy of an object, in every regard. The medium, gilt bronze ormolu. Value? Unsurprising, four figure sum, £1,000. From the ostentatious to the elegance of the Baluster tankard. 18th century, Chinese, and highly collectable. the value of the top lot there! That is amazing. You've played so well, I hope you've enjoyed it. and thank you for playing For What It's Worth. So, well done, Hilda and Cynthia! That was so well played. "All you've got to do..." But it's actually extremely difficult to do. From the very outset, I have loved the book. but gut instincts, first instincts, we're sticking with the book. Paul is going to tell you the worth of the things you haven't won. Let's start with the cups. Paul? Well, exotic, are they not? And they really do look rather handsome up there. not solid silver and likely nowhere near that old. All you lost there was £50. And then it comes down to the hall stand. It happens to be extremely elegant, in every regard. it's attributable to a cabinet-maker of some note. -Oh, sorry, Mum! Sorry, Mum! It's nice to be proved right! Yes, that's what mums like, isn't it?! -"Hey, never mind, I was right." OK. It all comes down to the book. You've won the value of this book. which may be worth a great deal more...or not. Hilda and Cynthia, here is your lot. This beautiful Oscar Wilde first edition. As things stand, you have won the value of this book in cash. Paul, what have you got for them? an English made 19th-century officer's sword. in response to unrest in Continental Europe at the time. the original owner's armorial crest and monogram. which of course adds value. or are you going to stick to your guns with the book? Do you like the sword better than the book? Bearing in mind the hall stand. -and the book was more valuable. and it may have belonged to somebody famous. Shall we go with the sword then? -We'll go with the sword. OK. You're going with the mystery lot. Hilda's instinct was so strong and so right for the hall stand. -Was right over the book. and the book just cried out at you. -We can't change our minds. But...what's the value of the sword? -Paul, put us out of our misery. This is 1860, volunteer movement. that signed up at that time. were the great and the good. really does bring value to this piece. So that was £300, and that's £400. -It was the right decision though! It was the right decision, and I'm glad you made it jointly. Congratulations! You go home with £400. Thank you, Paul, for lending us all your expertise and knowledge. And thank you very much, hope you've enjoyed it. the lot to win the lot on For What It's Worth. Goodbye for now! Well done! 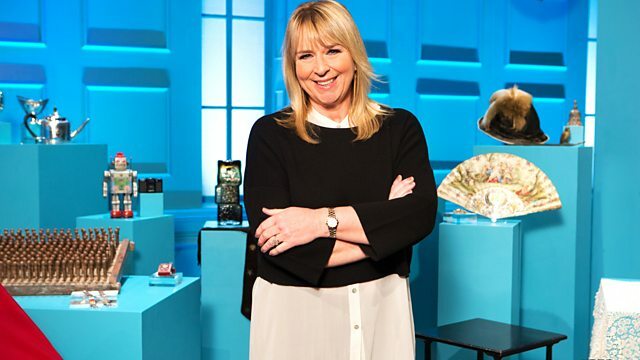 Paul Laidlaw assists Fern Britton, giving her expert insight into the wonderful world of antiques and collectibles as the three pairs of contestants answer general knowledge questions, hoping for the chance to add antiques to their collections and win the game.